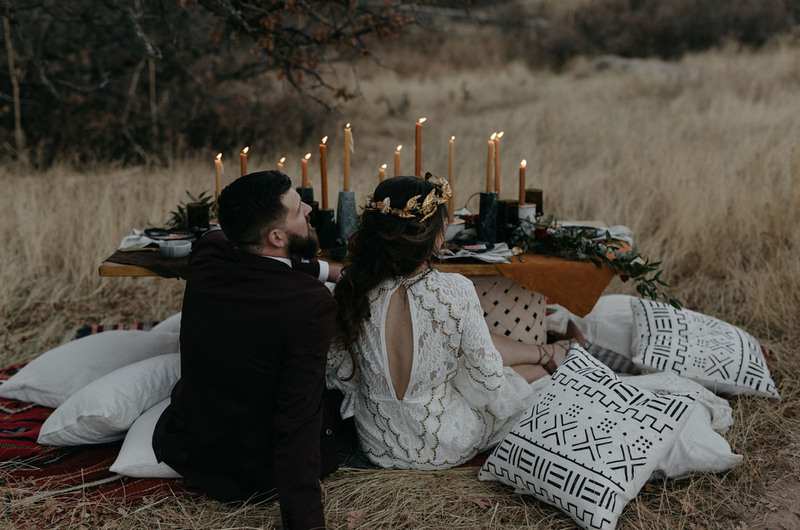 What would it be like to run away and elope in the wilderness? 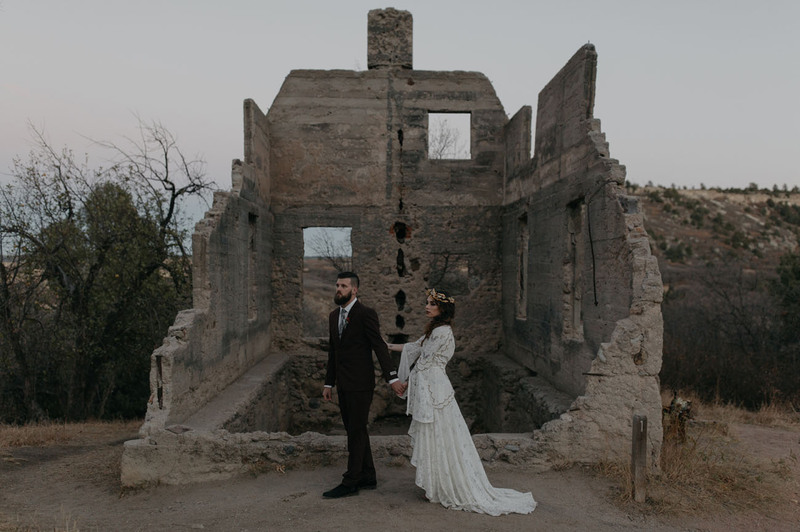 To stumble across ruins of the past and say your I Do’s? 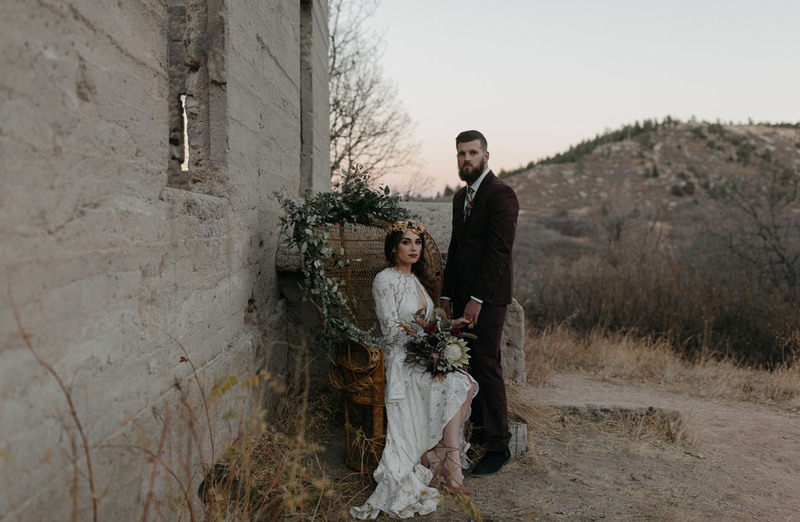 Well, Lindsey Boluyt Photography teamed up with several other creatives to come up with this dreamy elopement inspiration at the Castlewood Canyon Ruins in Colorado! 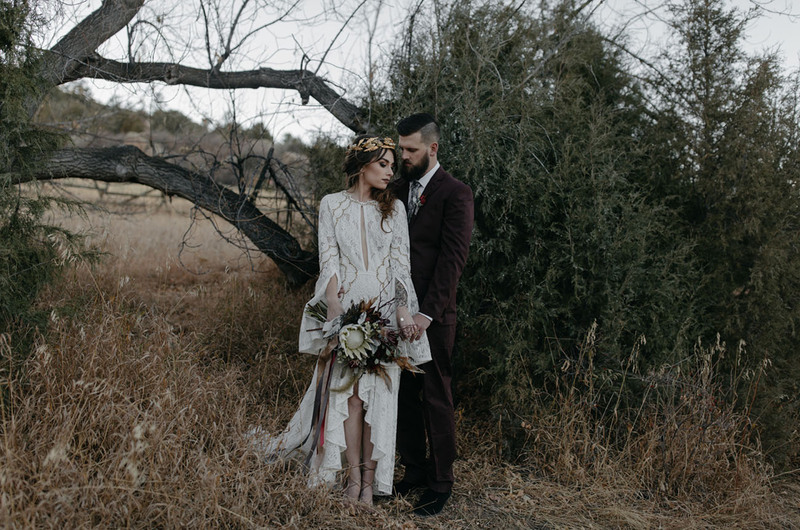 The bride wore an ethereal + bohemian-inspired gown and the groom donned a dark, almost burgundy, colored suit. 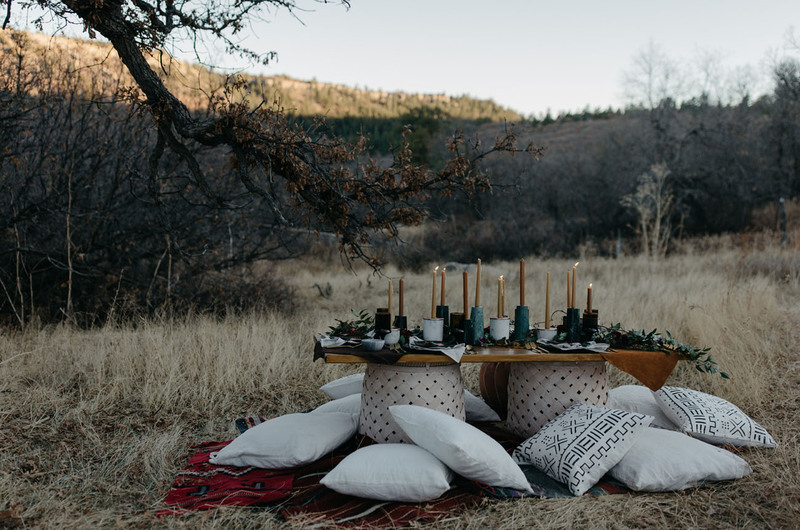 Topping off the day, Lauren Groeper of Chancey Charm Denver, designed a warm tablescape, complete with honey candles and cozy cushions. 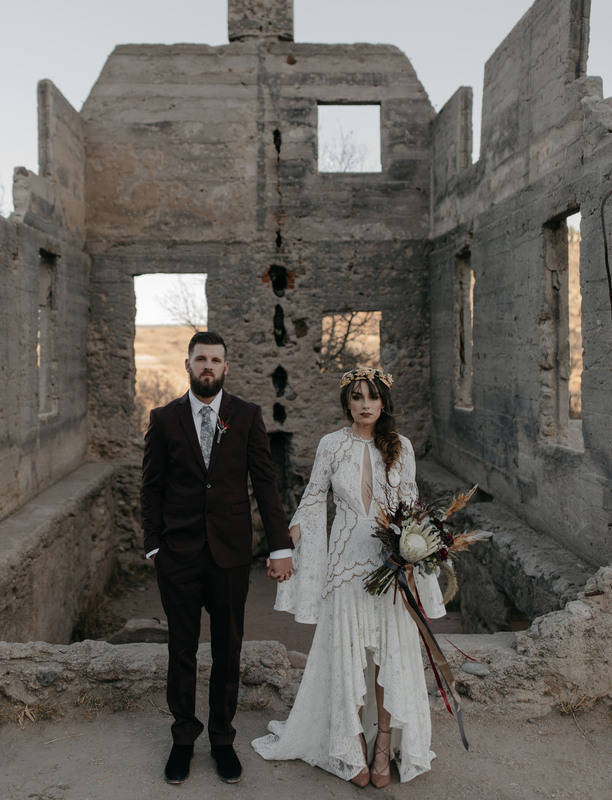 The whole affair took place around sunset, which highlighted the warmth and magic of this elopement. Let’s head to Castlewood Canyon in Colorado, shall we? 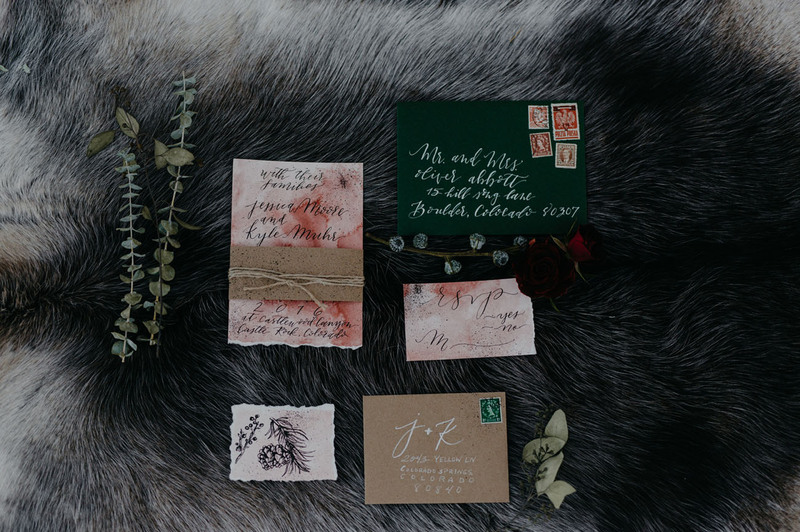 We’re big fans of the watercolor used for the invitation suite by Salt & Stag Creative! 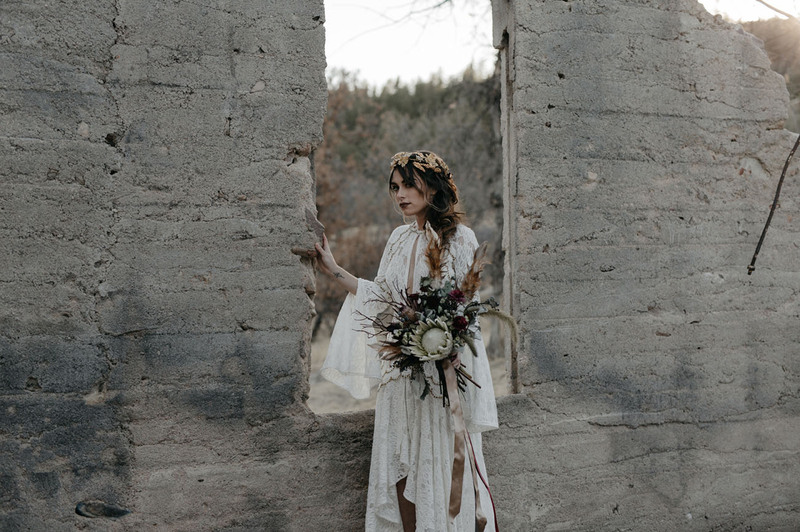 It gives off the air of something enchanting, moody, and slightly ethereal — don’t you think? 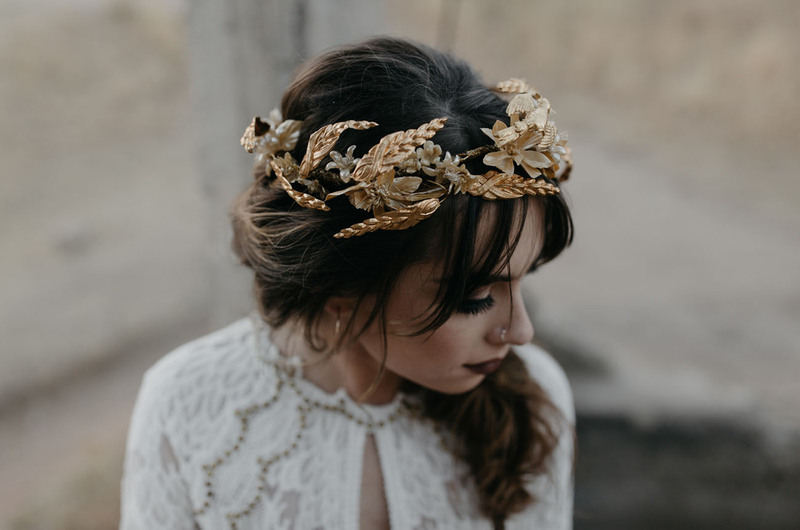 The bride’s dreamy gilded headpiece is by Heart of Gold Designs. THAT DRESS. 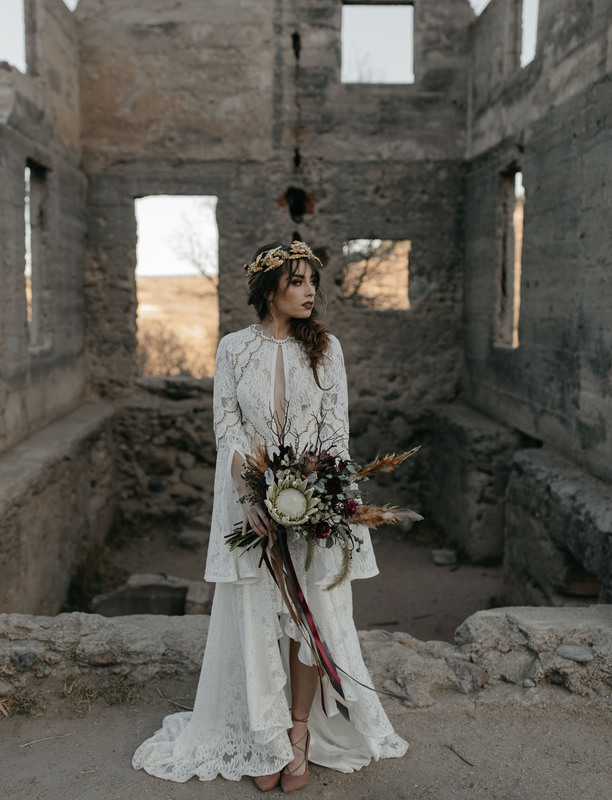 Holy smokes… From the lace, to the high-low ruffled hem, and the flared sleeves. 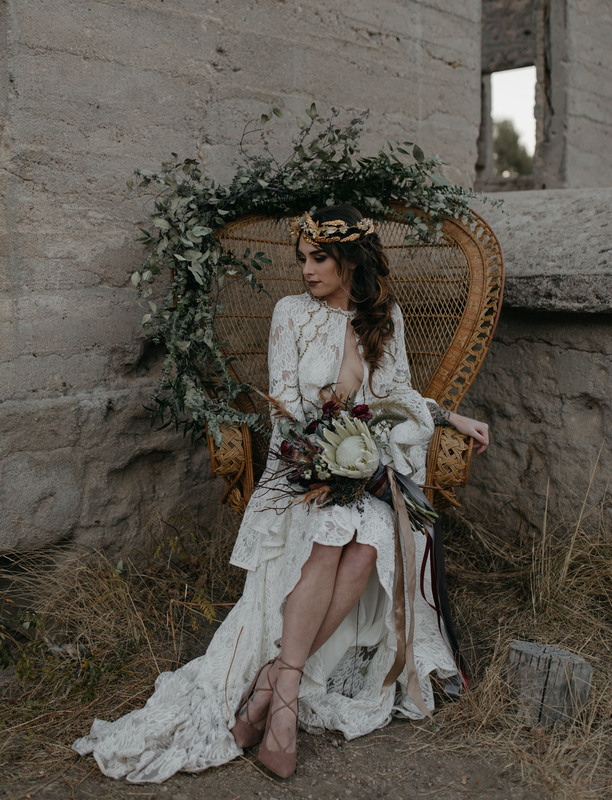 That beauty is by Rue de Seine from a & bé bridal shop. The Castlewood Canyon dam was built in 1890, leaked for years, and ultimately collapsed in 1933. The crumbling stone barrier is all that remains, but it certainly makes for an interesting setting! 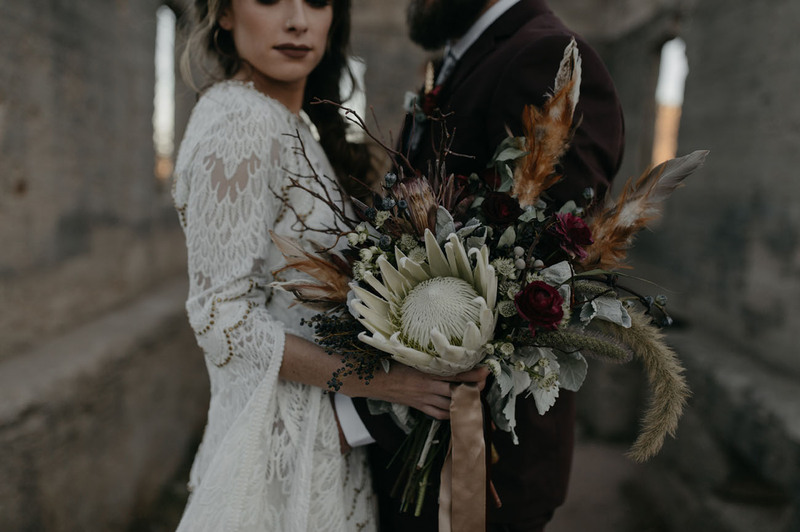 That rustic + edgy bouquet featuring a white king protea is by Bella Calla. 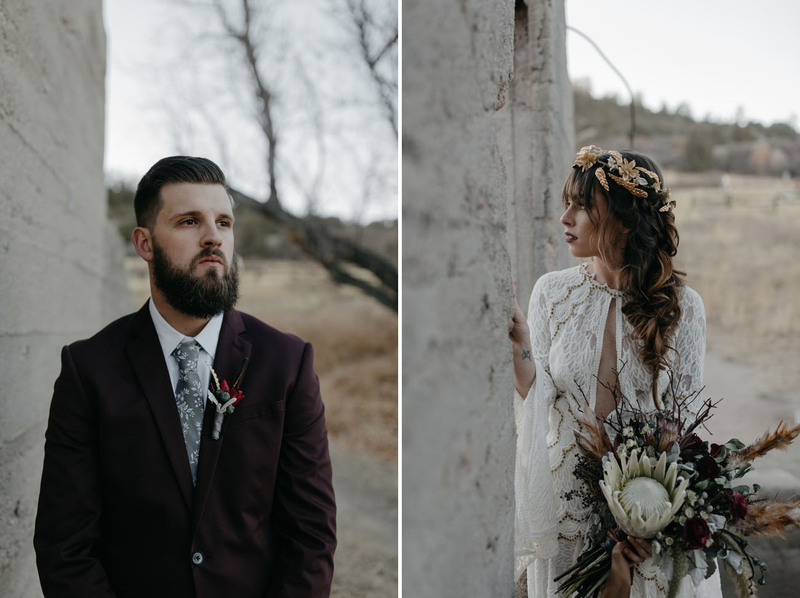 The groom’s suit is from Express Men. 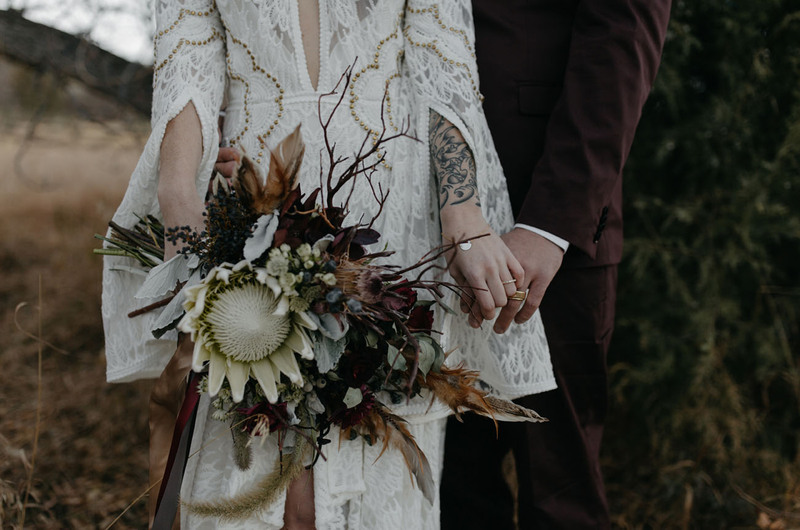 The bride + groom are wearing rings from Consider the Wldflwrs. 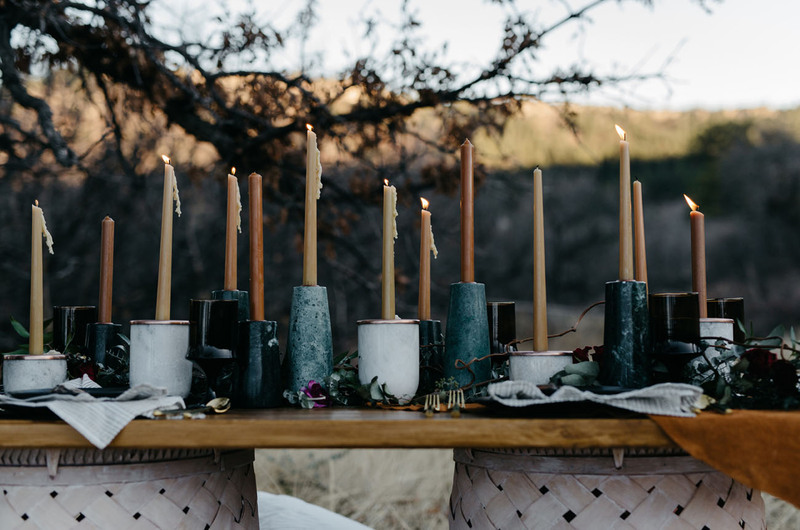 How many candles is too many candles? We’re pretty sure the limit does not exist!! 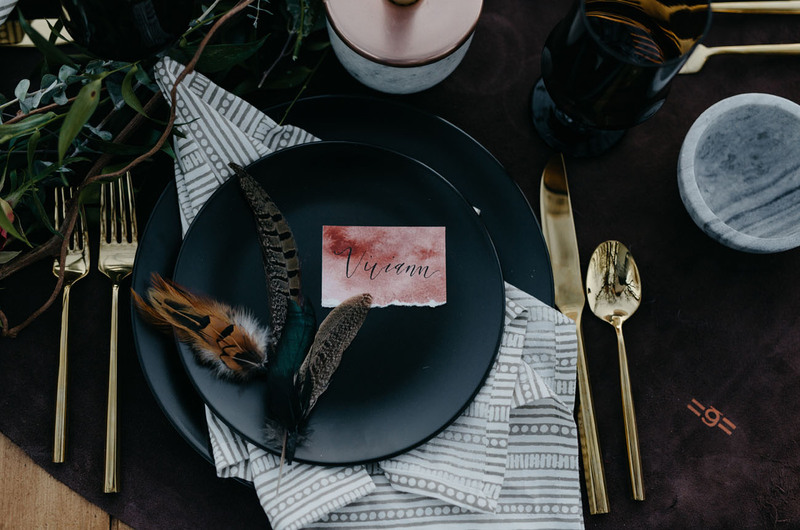 We’re crushing on those marbled vases from Hunt + Gather Rentals. 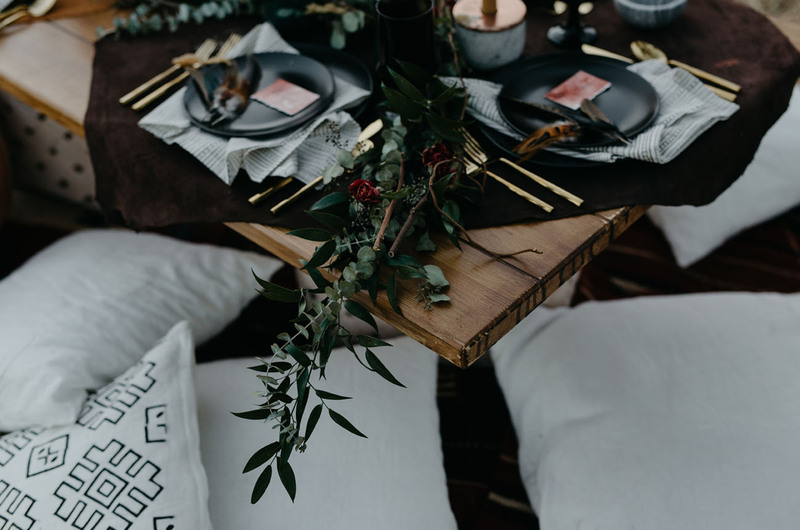 Could definitely see those being incorporated into a home after the ceremony! 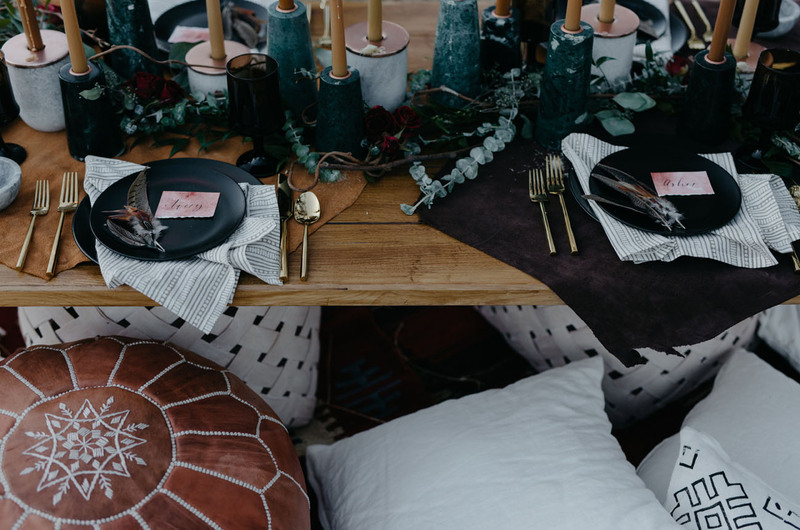 We’re all about adding poufs + mud cloth pillows to give an elegant tablescape a more casual vibe! 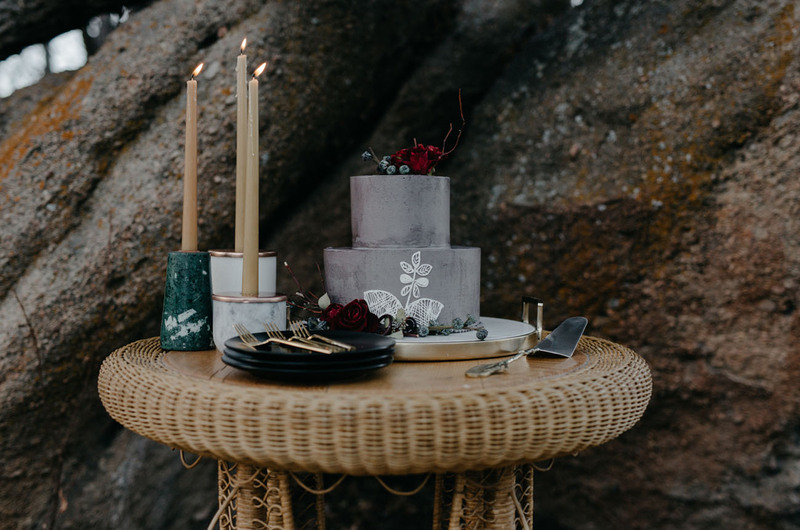 Indulge Bakery crafted that stone-inspired cake. Pretty darn enchanting, right?! 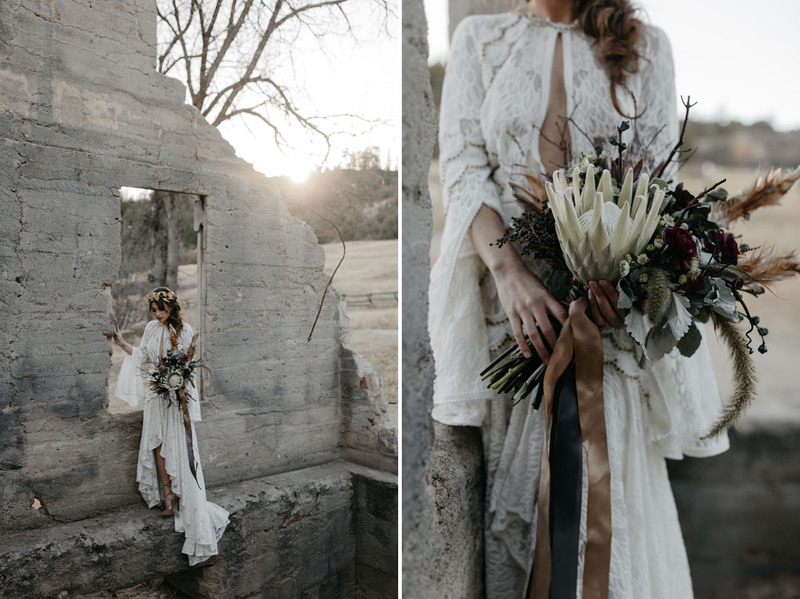 Thank you to the creative team behind this shoot + Lindsey Boluyt Photography for sharing! 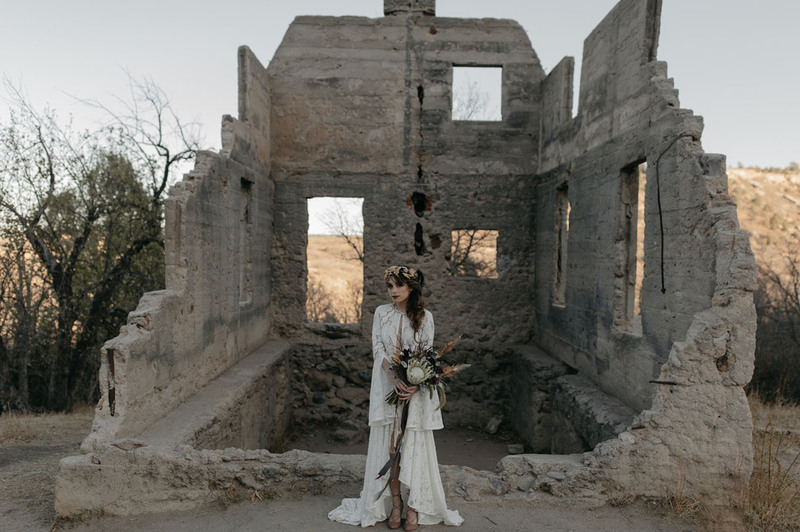 So, are there any dilapidated buildings or remnants of ruins around you? 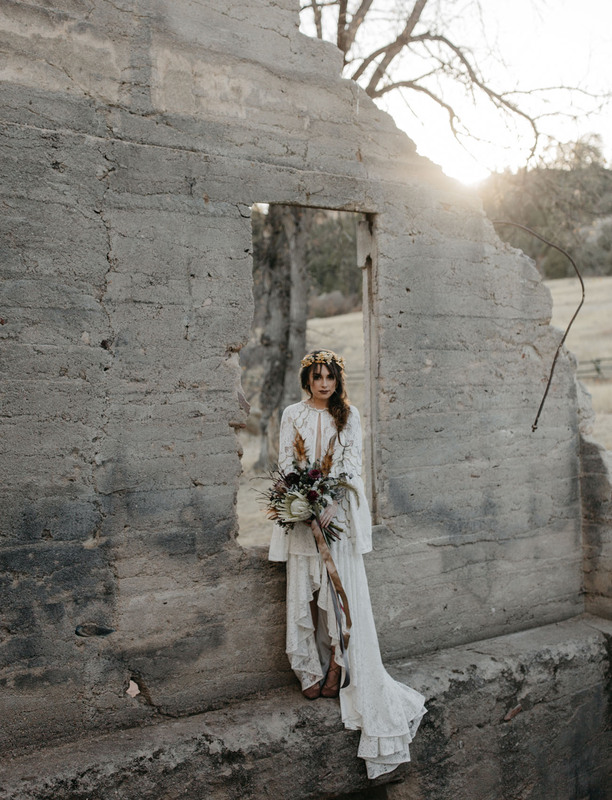 This definitely shows that they can make for one stunning backdrop! Well, Lauren has done it again! I’m mesmerized by how this came together. 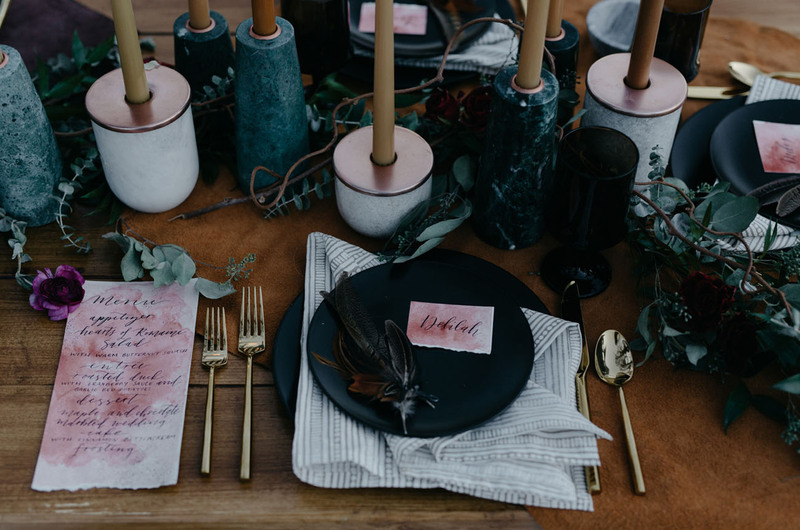 Those candle holders are just dreamy!! Hi! 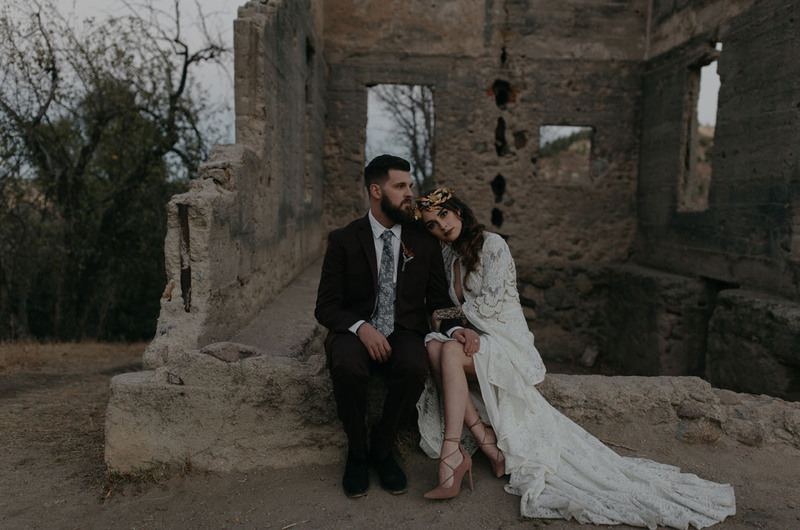 Do you happen to know which Rue de Seine gown this is? I don’t see it listed in either of their current collections.